An experienced climber himself, Mr. Krakauer gives us both a tactile appreciation of the dangerous allure of mountaineering and a compelling chronicle of the bad luck, bad judgment and doomed heroism that led to the deaths of his climbing companions. it is impossible to finish this book unmoved and impossible to forget for a moment that its author would have given anything not to have to write it. Into Thin Air is the story of the 1996 disaster on Mount Everest, a day where 8 people died descending in a storm. It is a gripping and harrowing tale, well told by Jon Krakauer, a journalist who was on the expedition to write about the commercialization of Everest for Outside magazine. This book is the expanded version of that story. The disaster is a story I know well, but I still found myself at the edge of my seat reading about it here. For readers who are less familiar with the details, I have to imagine it would be an even more exciting, intense and moving reading experience. A theme that comes up in a great deal of climbing literature (including this book) is that the climb is not an exciting act of the daredevil, but rather the slow, excruciating battle against the elements and oneself. Krakauer, as a climber himself, well understands this, and is able to tell the story (which is powerful to begin with) in such a strong way because the excitement comes from a tension at the heart of any expedition like this. On one hand, climbers are those who are able to overcome incredible physical and mental adversity to pursue their goal, at the same time, they have to make smart decisions about when to turn around. It is this dynamic which drives the book, and Krakauer does a great job structuring the narrative around it. It is also well written. As a writer, Krakauer does a nice job using both a stylistic voice and a direct, journalistic voice. He is able to interweave these well, capturing both the transcendent experience of being 28,000 feet above sea level with the intensely personal experience of trying to survive in the death zone. It is a breeze to read, and I found myself totally absorbed into the events as they unfolded. One thing that the author wrestles with throughout the book is the reliability of the narrator. At that altitude, the mind is dulled, and memories become sketchy. Indeed, Krakauer corrects a serious error he made in his original article in this book, based upon a faulty memory. We are never far from a reminder of this simple fact, that no matter how many people he talks to discuss the story with, there is a aspect of mystery to everything that happened. I also found Krakauer to be honest about his own role in the tragedy. He places blame on himself for failing to recognize Andy Harris' struggles with the altitude, and for remaining in his tent while his teammates were trapped in the storm outside. Though he ultimately diffuses the blame for the tragedy across a number of sources, he is willing to critically examine his own role in it. This self-reflective character of the book (in both these passages and in those considering the unreliability of his memory) are among the most moving in the book, and make it a very personal read. Finally, one cannot review this book without mentioning the controversy about the role of Anatoli Boukreev, a guide for one of the ill-fated expeditions. Boukreev summitted without bottled oxygen, which Krakauer argues forced him to descend ahead of his clients. Though critical of this decision (along with a couple of other decisions Boukreev made), Krakauer also praises him for the amazing courage he displayed when he went out into the storm alone, numerous times, saving the lives of a couple of stranded climbers. Krakauer's criticisms of Boukreev caused a controversy, which resulted in the publication of The Climb, a rebuttal to the events as they are described in Into Thin Air. Later editions of the latter novel contain a detailed reply to the claims made in that book. This has to be one of the best page turners in non-fiction books. I remember devouring the book in 2-3 days , reading late into the night and then tossing and turning with the chilling events of the book freshly alive in my mind. Krakauer is a masterful reporter and his out door tales (also Into the Wild) are fascinating and exciting to read. I read it almost in one sitting, staying up until 2 AM to finish it. I imagined the novel that begins, "I was left for dead." Krakauer's description of the ill fated season on Everest is so raw that you are left wondering why anyone would want to do such a thing. Perhaps, as his colleagues suggested, he should have waited to write the book, but time would have mellowed the sharp edges. The image at the end of hikers stepping over the dead bodies of those killed in the storm as they made their way to the summit was almost revolting but then I found myself considering the hardship those who were still alive had endured themselves so that such an act seemed somewhat less inhumane. It grabbed me, drew me in, and didn’t let go until the last word. I found the story intensely fascinating. Krakauer ‘s vivid descriptions made me feel like I was on the mountain with him. I could start reading it again tomorrow. Into Thin Air is a personal account from a man who climbed Mount Everest as part of a commercial climb in 1996. The climb ended in tragedy, with the mountain claiming the lives of many of the members of the teams. The author, Jon Krakauer, attempts to tell his recollection of the events, keeping in mind that everyone lacks clarity when you are at that altitude and your mind and body are deprived of oxygen. He discovers along the way that he misjudged and misremembered events that happened on the mountain, and the story has a huge element of surprise when he learns where he made mistakes. It seems wrong to say that I “enjoyed” this book, since it is about such a tragic subject. I guess the best thing that I can think to say is that this book was fascinating. Before I picked it up, I knew very little about climbing Everest. I had no idea that an attempt to reach the summit included going up and down portions of the mountain several times, and over a period of 4 weeks. I assumed that it was more like climbing a less-imposing mountain, where you are always camping higher until you reach the summit. I didn’t know that it was much more of a two-steps-forward/two-steps-back endeavor. I also didn’t realize that helicopter evacuations are not possible anywhere near the top of the mountain, so your options for getting the injured down from the summit are very limited. I guess I had never considered all of the physical limitations that come with that kind of altitude. Supplemental oxygen is a necessity for survival over more than a day or so, and all oxygen must be carried up. That means that if something goes wrong, there isn’t an abundance of time for action. Into Thin Air is the story of the 1996 Mount Everest disaster as told by a reporter who was part of the expedition. Over the course of the climb down the side of Everest, twelve people lost their lives. Into Thin Air details exactly how they died to the best of Krakauer’s ability. The book is, obviously, written in such a way that one knows from the beginning that specific people are going to die. That knowledge is what inspires the morbid fascination that kept me glued to this book for hours on end. Mountaineering, admittedly, is not something I am particularly interested in, and at times I did find it difficult to understand why on Earth anyone would want to climb up a mountain when there was obviously so much danger involved. I suppose that its thrill is similar to that of gambling, only the people climbing are betting not only money but also their lives on whether or not the mountain will kill them. I mentioned a feeling of fascination coupled with morbidity, and this book did inspire a certain amount of anxiety, if not fear, in me, for I was reading about men- and women- who are now dead. Who staked everything on their ability to survive, on their guides’ ability to make decisions when thin air makes rational thinking all but impossible. Who gambled and lost. And their companions had to leave them behind. One of the more frightening parts of this book is how Krakauer describes the death of each of these people in depth, whether they died of disease or froze in the snow. I did find that the descriptions that frightened me the most were those of Ngawang Topche and Yasuko Namba. Ngawang fell ill early on in the book but his death was no small matter. He had contracted HAPE, a dangerous high-altitude disease, which was made more dangerous by some pre-existing pulmonary condition. He was shuttled down the mountain and brought to the doctors as quickly as possible, but he still died after struggling for days. Yasuko made it to the top of Everest, but was trapped with the others when that fateful storm blew in. She and another member were separated from the group and lost their way trying to find the camp. When searchers found them they were both alive, both breathing, but it was evident that Yasuko had gone beyond the point where the doctors could save her. By some miracle those two had survived in the cold, and the expedition had to leave her behind anyway. If they hadn’t, there would have been more death. Walking hand in hand with that reality is Everest, spreading its message that mountains are not things to be trifled with, no matter how skilled the climber. In the end, the mountain is the one that decides whether climbers live or die. The smallest storm on top of that mountain can kill a man easily. The truth is , as it says in the book, that getting to the top of a mountain is easy. It’s getting down that matters. In 1996, Jon Krakauer was sponsored by Outside Magazine to accompany a climbing expedition to the top of Mount Everest. This particular expedition ended in disaster after an unexpected storm left eight dead and several others with severe frostbite and permanent injuries. Krakauer's account of the expedition includes historic information about extreme climbing at high altitudes and explains how high altitude exposure can lead to delirium, confusion, life-threatening medical conditions, and a high risk of death. This autobiographical account is supplemented with interviews by the survivors, to try to bring an honest and multi-faceted perspective on the motivations of the climbers and guides. In 1996, journalist and mountain-climbing enthusiast Jon Krakauer joined an expedition to the top of Mt. Everest as part of a magazine piece he was asked to do on the increasing commercialization of Everest expeditions. Karkauer reached the top and came back alive, but many of those who made the attempt at the same time, including several members of Krakauer's own group, died on the mountain. This book is his attempt to explain, both for his readers and himself, what happened and why. Most of the account describes the ordinary business of climbing Everest -- if "ordinary" is remotely the right word to use for such an endeavor -- with a lot of background on the history of the mountain and its climbers, and a lot of detail about what an Everest attempt entails. Towards the end of the account, when disaster begins to strike in earnest, he continues to attempt to give as objective an account as he can muster, but also shares the depth of his survivor's guilt and his anguish at the role that he played in events. What's particularly interesting about those events is that there are no obvious lessons to take from them, and no clear, simple narrative about actions A, B, and C leading to disastrous consequences X, Y, and Z. Instead, a lot of things just happened: weather, illness, bad choices and misperceptions by exhausted, oxygen-starved people. My personal take-away from this narrative, honestly, is that attempting to climb Everest is a fundamentally crazy, even self-destructive act. Not because it's a harsh, dangerous environment where rescue in the event of disaster may be impossible, but because it's a harsh, dangerous, difficult-to-be-rescued-from environment where the human mind and body are not capable of proper functioning. But it's one that has just enough of a chance of not actually killing you that people insist on trying it anyway. Which I'd say makes it much worse place than, say, Mars. Nobody's going to try exploring Mars without proper life-support technology. I am just one of many readers. When I give this book two stars it most accurately answers the question how did I react to the book. This is how I rate all my books. This book was OK! That is what 2 stars is said to mean on GR! That does not mean it was bad. I will explain why I have reacted as I did so hopefully you can more easily determine how you may react to the book. Why all this explanation? Because I am thinking that if I only give this book two stars that will give an unfavorable impression, and it isn’t a bad book. I am tired of everyone rating books favorably when that is not really how they reacted to the book. You see it all the time. People say they liked the book, and then give it a five star rating. A five star book is supposed to be amazing. You are supposed to leave a five star book dazzled. Sorry for that long-winded explanation, but this has been bugging me. Jon Kraukauer is a journalist who has written for the sports magazine Outside. His climb of Mt. Everest was initiated by a request for an article on the commercialization of the mountain, the highest in the world. Such an article preceded the writing of this book, and it sets the tone for the book. I was unaware that the commercialization of Mt. Everest would be a central theme of the book. I was unaware that the book would be directed toward mountaineers and sport enthusiasts, that being because it grew from the article in the sports magazine. If you are a mountaineer yourself, you will be more interested in the detailed exposition of who has climbed which mountains and when and with which equipment. (I prefer trekking and I am not gear oriented.) The history of climbing is interesting, but here you get a rundown of each climber’s accomplishments and failures. I couldn’t keep all the different “big names” straight, and there are many, both in this excursion and in the numerous others mentioned. This information interrupts the telling of what happened in the 1996 Everest disaster, which is what drew me to the book. Who were at fault? Why did it happen What can be done to improve safety? Is there one answer? No, of course not. Sandy Pittman/Sandra Hill has written articles and spoken of her view of what happened. There is also Anatoli Boukreev’s book : The Climb: Tragic Ambitions on Everest. In his book, Krakauer clearly criticizes Boukreev, but it was Boukreev who saved Sandy’s life. All three were there, along with so many others. Climbing Mt. Everest has become a business, a commodity to be sold, and on that day when the storm hit there were so many people there were bottlenecks and queues up there near the summit. Mountaineering, at least on Everest, is not a solitary sport! So at the bottom lies also my dislike of “the crowd” and of a sport that seems to me ridiculous. If people choose to put their lives at risk, well then they better be prepared for the consequences. Krakauer’s belief that it might be worthwhile to forbid the use of bottled gas, which enables all too many to attempt what they are untrained to do, is not a bad idea. How do you enforce that?! Do you deter people through exorbitant fees? All of this is discussed. Very little of the book is exciting, and at the end I don’t know if I have any clear answers. The author narrates the book himself. Not a bad job, but I did laugh at how he pronounced the Swedish mountaineer, Göran Kropp’s, first name. Someone could have told him. It is such a common name. It made me wonder if he pronounced other names incorrectly, the Sherpas’ for example. Into Thin Air is an absolutely brilliant book in which Jon Krakauer details his experience climbing Mt. Everest in 1996 as well as looks at the history of Everest and those who have climbed it in the past. The historical element is fascinating (Krakauer really knows how to research and how to fit the historical aspect into the present-day story), but Krakauer's intensely personal story of his own climb brings me to tears every time. His depiction of the people he climbed with, the arduous climb itself, and the tragedy that unfolded on "summit day" that left several people, most in his climbing party, dead, is heart-wrenching. In the preface, Krakauer explains why he decided to write a book about this experience -- though he was originally on the Everest expedition to write an article for Outside magazine, he found when he returned that a simple article was not enough to sooth his painful memories. Thus, he wrote Into Thin Air as an act of cartharsis, and the emotion imbued in his narrative is palpable throughout, especially as it becomes evident that Krakauer has yet to forgive himself for the events of that day. So, I had planned to read this book for last year's Modern Classics challenge, but never got around to it. Then, after my sister incessantly berated me, I picked it up. It started kind of slow, as did Into the Wild (one of Krakauer's other books), but it got really good. Krakauer has this way of telling a story where you already go in knowing what happens; seriously, he tells you in the preface notes that a bunch of people died in a horrible storm, but you still keep reading. Probably because in the "tedious" set-up of the book, he has laid out the meticulous nature of these guides (whom you know end up dying in the end) and you ask yourself, "What went wrong?" The only problem is that you can't really read this book if you're looking for answers--there aren't any. Sometimes accidents happen and the people who were in the position to anticipate and/or prevent the "accidents" are all dead, so we can't know their motivations or thought processes. Also, the people who are still alive sometimes have conflicting accounts of their own experiences. None the less, the book does open up discussions for interesting topics such as, "If there's a point on the globe that's so high that it's nearly impossible to reach it without compressed air or the assistance of hard-working, and perhaps under-paid, sherpas, should we be going there?" Granted, there are a handful of people who have summited Everest without using canned air or the assistance of sherpas (one guy in 1996 did it... he's an all-star in my book), and maybe this mountain (a sacred part of Himalayan culture) should be left alone except for the truly exceptional people. Who knows? That's not necessarily for me to answer, but I've definitely been thinking on this for a couple of days now. This book was so fantastic that I'd recommend for everyone I know to read it (with the up-front disclaimer that it's worth plugging through the "tedious" part so you can really get it in the end). Also, several other people who were on the trip have written their own accounts (my sister read Beck Weather's book, Left for Dead, and I'm intrigued beyond belief to read this, also Mike Groom, a guide from Scott Fisher's team who lived wrote a version based on his recollection). The author describes his spring 1996 trek to Mt. Everest, a disastrous expedition that claimed the lives of eight climbers, and explains why he survived. You start this book - you finish it quickly. It is a positively engrossing, and easy, read. 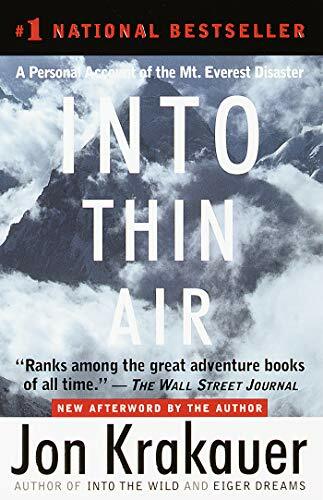 Into Thin Air is a graphically horrifying depiction of both the adventurous and well-trained mountain climbers and the very rich and very bored who prey upon the former in their quest for celebrity. You and I may not have the same all-encompassing drive to do that which most people would dismiss as foolish impetuosity and a certain death wish but Jon Krakauer does an exceptional job making us understand what drives these people to climb the highest, move the fastest, fly the highest. We can stay comfortably in our safe chairs and still experience the ecstatic highs, the abject fear, the cold and misery of the bravest (or craziest) among us. I read this one a while ago, but I remember that I couldn't put it down. The story was compelling and well-written. It was all too easy to imagine the horror of the situation these climbers faced. I first read about this story in Adventure magazine. This is a facinating story written by a person who not only was there and survived but an uthor by profession. There are several books written on the topic but this one is gripping and sets the bar for all others. Must read. The apalling, enthralling story of a writer caught up in a disastrous storm that hit several teams of inexperienced climbers on Mt. Everest. The book is a very good read. The events are terrible, tragic, but it's difficult to put the story aside. I first heard of this story when I saw the Omnimax movie, "Everest," which was filming on the mountain when the storm struck. The film crew did what they could to help out, but a number of climbers were lost. It's disturbing to think that people are allowed to climb the mountain when they clearly lacked the experience (much less the equipment) to do so. At the same time, who's to decide who is ready and who's not? An amazing story of a guided climb of Mount Everest in May 1996 that led to the deaths of nine people, including two of the most experienced guides. Krakauer describes various histories of climbing Mount Everest, and describes some of the remarkable people who make up the elite club of those who climb the most difficult mountains at high altitudes. He describes well the several weeks of acclimatization that climbers must go through to be able to function at great heights, even if one is to use oxygen in the final ascent to 29,028 feet that is Everest, and he tells of the ultimate elite who have, in some cases a number of times, climbed without oxygen. The chief guide of this tour said that he could get any reasonably fit person to the top of Everest and back, and he had done so many times, but this time a howling blizzard with wind chills of -100C caught the group as they were at or near the top or beginning to descend. And it is the descent that in many ways is the most dangerous because of the incredible fatigue and the adrenalin burnout that follows actually getting to the top of the world. Not all of the climbers in the various guided groups (at least three or four on the mountain at the same time) were experienced high-altitude climbers, nor even very experienced climbers in some cases; Krakauer recounts the story of one guide having to teach basic ice climbing techniques to a member of one of the groups. These are people with more money than brains (the group Krakauer was with charged $65,000 US each). Krakauer also describes well the incredible effect that living at high altitude can have in terms of sickness of the heart and brain, and what being in an oxygen-deprived atmosphere does to powers of judgement and even the simple abilities to walk, to talk, and to think. The story of the loss of people in the storm and the desperate attempts to find them is heart-rendering, and so is the accounting of the incredible demands that the climb, compounded by the emergency, placed on mere human beings. There are stories of incredible fatigue, incredible fortitude, incredible selfishness and thoughtlessness, incredible sacrifice. It seems that everything is magnified and focused in that most extreme of environments where a single misstep can mean death either instantly through a great fall, or more slowly through exposure and freezing. The most incredible story of endurance concerned a doctor from Texas who was given up for dead by his rescuers (even though they detected some breath after they chipped three inches of ice off his face when they found him after a night in the blizzard, but no one had the strength to carry him); who then walked, on his own power, into the camp a few hours later; was given the minimal treatment available (this was near the summit) but not expected to last the night; who did last the night although his tent collapsed in the storm and was almost smothering him; who was brought down the mountain and eventually into a hospital with the worst case of frostbite and frozen skin that the doctors had ever seen; and who lost an arm mid-forearm, several fingers off the other hand, and several toes, but who still hoped to be able to practice medicine!